I had hoped to write several background posts on the boat and our trip planning to date, but time is running short so that will have to wait for another day. Right now we are at the stage of trip planning when we are BURIED in lists. Lists of stuff related to the boat, lists of stuff to get for homeschooling, lists of reference books and medical supplies and galley supplies and snorkel gear and and and..... The reason for all of these lists is that, other than food, fuel and a few essentials, we expect that we won't have access to well-stocked, reasonably priced stores for maybe 6 months. The assumption is that we'll make it to at least the Bahamas, Turks and Caicos and the Dominican Republic this winter, but if we don't make it to Puerto Rico, the shopping opportunities are going to be fairly thin. So not only are we looking for the kind of household crap that can drive you crazy (think soap dishes and vegetable pealers), but then there's all the specialized stuff that we need (or think would be wise to have), like a Hypodermoclysis system and tools for celestial navigation. Your vocabulary lesson for the day: Hypodermoclysis is a subcutaneous hydration system that you can use instead of an IV. THEY SAY it is quite comfortable and safe. For those that have known us for a while, this might be needed if Danny meets another mosquito carrying Dengue Fever or if anyone on board gets so severely seasick that they can't hydrate. And the celestial navigation stuff, well, that's just in case and for geeky sailor fun. As you might imagine, all of the lists are kind of annoying. But the good news is that the lists - including the boat work list - seem to finally be getting smaller rather than larger. Here are pics of a couple of the many things that have been completed. We've renamed the boat (including the obligatory denaming and renaming rituals where you request Poseidon to update his boat registry and pour lots of champagne overboard - not kidding here). The new name, Blue Kai, is each of the kid's middle names (and which, not completely coincidentally, means blue ocean). Oh, and we did get the mast back on the boat. (We took it off for some re-rigging and to cut a bit of it off so that we are can use the Inter-Coastal Waterway without hitting bridges.) You know, just some minor stuff. 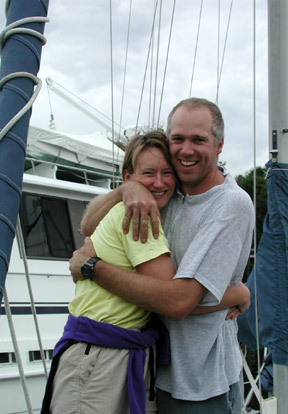 A long time ago, in a galaxy far, far away..... a newlywed couple from Seattle went sailing for 6 months on a small, old monohaul with no refrigeration, an SSB receiver (but no transmitter) and a couple of hand-held GPS units. It wasn't always bliss (it is sailing after all), but they had a great adventure. After they returned home, they got "real" jobs and had a child and then another. But no matter how settled they appeared from the outside, they longed to be out on another sailing adventure. So they hatched a plan to one day go sailing with their offspring around the Pacfic. They decided that 2012 seemed like a reasonable goal for the trip, which in its infancy was called the "2012 Pacific Cruise." Flash forward 10 years and the boat now has been purchsed (it's a sturdy 47 foot Nautitech catamaran) and they're diligently getting it ready (that long list of pre-trip repairs will come later). It happens to be in Jacksonville, Florida instead of on the Pacific (it's warmer so maybe the children won't mutiny within the first 24 hours underway). But if all goes well, they will be casting their lines off within the next few weeks -- just in time for 2012. 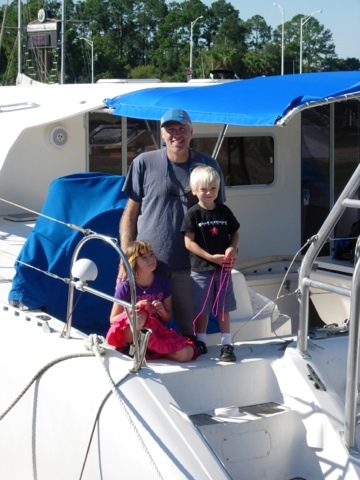 So join us here for the adventures and misadventures of the Sailing Vessel Blue Kai, which may or may not make it all the way to the Pacific (depending mostly on whether the boat can withstand our kids). p.s. If it's not obvious, the first picture is from the honeymoon. The second from Blue Kai.